All Saints’ Church in Oakham is the town’s largest church. All the old roads into Oakham lead to the church. Therefore, its impressive spire can be seen from all directions. A Grade I listed building, it is said that the church was originally constructed as far back as the 13th century. All Saints’ organises a range of worship and community activities. This church prides itself of opening its doors to all who wish to enter and discover is awe inspiring architecture, history and community. 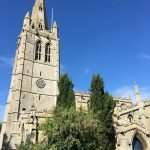 The church values its musical life and positive, engaging preaching, maintaining a good relationship with the other nine churches in Oakham. Nearby landmarks include Cutts Close Park, The Buttercross and Oakham Castle.